Thinking about where you live (or where you want to live) should deliver the emotional equivalent of fireworks. Your property (or prospective property) is spectacular. Shouldn’t the language used to describe it have the same impact? The fact too, is that Real Estate, with the help of increased consumer awareness thanks to a flood of new design channels and magazines, has never been more based on the visual. We’d argue though, that language still plays a crucial role. Just like the appeal of a property hinges on its presentation, so does the arrangement of words used to describe it. Think of it this way. How many times have you seen a movie version of a book, and left the theatre disappointed? This is because of the power of language (that is good and cleverly crafted) to engage the imagination and to conjure in a deeper way. When it comes to writing about Real Estate, this philosophy is something that we have embraced for decades at urbaneer.com, and like to think that we have positioned ourselves on the cutting edge of Real Estate Copy. Real Estate, and the promotion of it, is a dynamic entity and deserving of worthy language and cunning word play- to not only catch the eye of prospective buyers, but to help communicate what a property is like. Really like. Furthermore, words sit differently on pages than they used to - whether they are imprinted forever in ink, or are accessed conveniently online. The way in which copy is presented has to be re-tooled as well. We don’t just assist buyers and sellers; we’d like to think we introduce lifestyle and experience as part of the package. And, truly, one of the greatest gifts in any experience is to either go in with, or be able to extract on the way out, some measure of humour. For some, humour is a coping mechanism. For us, humour is part of our fabric, and it only makes sense to roll this in to one of the things we do best - and do differently - promoting properties. Our love of Real Estate language has many outlets. 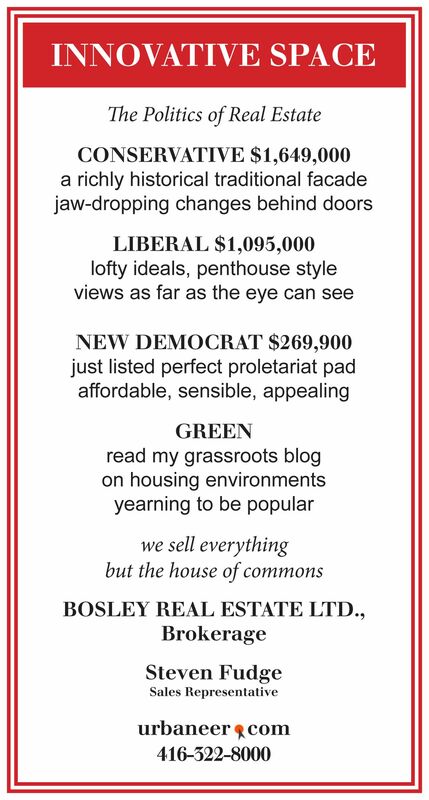 In addition to our listings, written with pizzazz, zing and bling, we have been running INNOVATIVE SPACE (double meaning intended) columns in the Real Estate section of the Globe and Mail for the past couple of decades. We love these ads because we get to bend and craft language in a humorous way while laying down a slick marketing strategy at the same time. Take for example, our ad, below, posted the week of our Federal Elections. We know there are those who roll their eyes over urbaneer’s zany adverts. Especially the old-school real estate relics from the golden age of newspapers. Back in the day their fingers turned black with ink as their digits scanned the ubiquitous columns of banal real estate ads that plainly stated the location, dwelling type, number of bedrooms, and whether the basement had a wet bar or wood paneling, all in the most perfunctory and abbreviated manner. In a nutshell, for the better part of last century real estate advertising was rigidly confined within the limitation of location, bricks and mortar, often using dull boring descriptions. It was all practical and zero inspirational. Even as a housing obsessed child (at the age of ten I was making my father take me to open houses), I always thought there was a better way to write Real Estate copy. And then in 1989 serendipity presented itself. Armed with a multi-disciplinary education on Housing, I became a Realtor who cultivated his specialty in the sales, marketing and development of several warehouse conversions while pioneering the Innovative Space marketplace focusing on loft warehouses, contemporary dwellings, income opportunities and low-maintenance living in the original City of Toronto. First, when any newspaper or magazine page is crammed with a lot of small font copy, draw the reader’s eye to your ad by leaving lots of white space within a bold border. Second, marry spatial descriptions with lifestyle adjectives to create intrigue and desire to convey a mood. Third, vary your ad using clever, amusing, or silly themes that aren’t real estate specific, while keeping your brand logo the same. This guarantees you’ll be distinctive from other ads while retaining continuity. Fourth, be succinct a la haiku. Offer enough information to captivate and intrigue but compel the reader to seek out more information by visiting your website. Finally, create an opportunity for readers to smile. It provides your brand a positive reinforcement while spreading a little joy. While this may not work for everyone, it works splendidly for urbaneer.com! With a multi-disciplinary education in housing, over twenty years of real estate sales, and an innate sense of how to craft Real Estate copy that stands out, please know we’re here to help! If you need assistance, insights, or guidance maneuvering market realities as they pertain to you, log on to urbaneer.com to learn more about us! Not online? Just pick up the phone and call us for an introductory package at 416-322-8000. Consistent top producers for over 20 years, we are your friendly, effective real estate team! Are You Selling Your Property? Consider urbaneer’s Style Enhancement Service!